Recent­ly, I stum­bled upon an adver­tise­ment for this object. 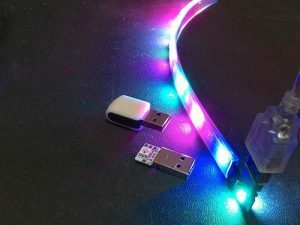 It is a gad­get called Blink(1), which can be plugged into a USB port and which has two col­or LEDs, one on top and one on the bot­tom, that can be con­trolled by a piece of com­put­er soft­ware to show any col­or in any bright­ness. The gad­get is cost­ing around 40 swiss franks and it has a nice piece of con­trol soft­ware, which can be used to make the gad­get light in many dif­fer­ent use­ful ways. For exam­ple, IFTTT (If This Then That) can be used to make it light in var­i­ous col­ors upon giv­en con­di­tions, or URLs, files or scripts can be called to define col­or com­bi­na­tions, or a mail­box can make it light up if a giv­en num­ber of new mails arrive, or if the mail of your sig­nif­i­cant oth­er arrives or if the mail has a cer­tain sub­ject line. Or you warn of a low bat­tery, or when the CPU load exceeds a cer­tain per­cent­age. The whole thing is hap­pen­ing in a very small pack­age, of which the plas­tic cov­er and a alu­mini­um frame can even be removed, so that the result­ing extreme­ly small device fits in my small lava lamp. The home­page of the Blink(1) shows the set­up and pos­si­bil­i­ties of the gad­get in-depth, where to buy it, and so on. 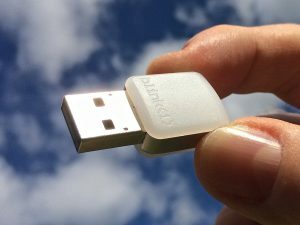 I decid­ed to give up my own hard­ware, even though design­ing the cir­cuit (part 1), build­ing it, and pro­gram­ming the firmware (part 2) was great fun. But thanks to the Blink(1) I can save the exten­sive effort of devel­op­ing the com­put­er soft­ware. Instead I can just use the “Blink(1) Con­trol” soft­ware and only need very lit­tle adap­tive work.